Datakom offers hightech,web based genset controllers and energy quality products includes power factor controllers,network analysers,protection relays.The Rainbow Scada represents the ultimate point of remote monitoring systems.Products have multi-communication ports (GPRS,ethernet,etc) Many products UL certified. 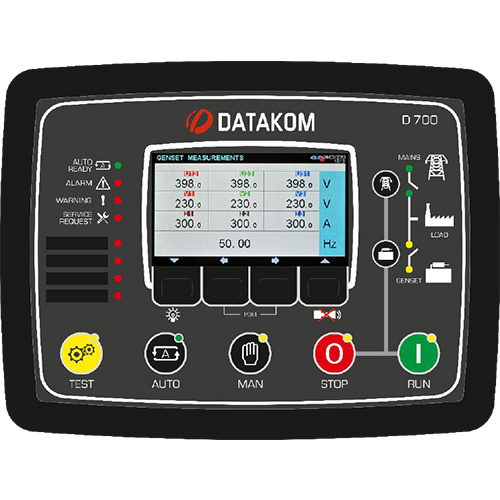 The new D-700 is tomorrow’s genset controller meeting a multitude of requirements and functionalities within a single product, reasonably priced in its base version and unlimited for expansion. The same controller provides synchronization, load share, mains synchronization, soft transfer, AMF, ATS, Remote Start, Engine Control and Remote Display Panel functionalities. The module comes ready for remote monitoring over GSM or Ethernet with plug-in communication modules. Various plug-in modules provide unlimited expansion capabilities allowing to meet any special requirement.